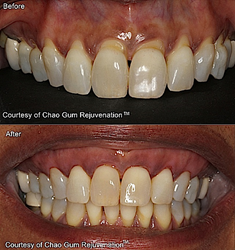 The minimally invasive alternative to conventional gum grafting, Chao Pinhole Gum Rejuvenation™ corrects receding gums with no cutting, no sutures and no downtime, says inventor Dr. John Chao. Over 100,000 "Life After 50" readers in Southern California will see the article which publishes August 1. Chao Pinhole Gum Rejuvenation™ the revolutionary minimally invasive alternative to conventional gum grafting surgery will be featured in the August 2016 issue of “Life After 50” magazine, distributed in Southern California from Ventura County and Los Angeles County to Orange and San Diego Counties. Also known as the Chao Pinhole Surgical Technique® (PST), the technique is changing the way general dentists and periodontists are treating their patients for receding gums. Until recently many patients diagnosed with gum recession would decline having treatment rather than undergo conventional gum grafting surgery which requires cutting of donor tissue from the roof of the mouth and grafting the tissue to cover the receded areas using sutures. With the “Pinhole”® procedure a doctor can correct receding gums without cutting or sutures and with little or no downtime required. There is virtually no pain or bleeding and there is instant transformation of the defective gum line. Once patients learn that their gum recession can be reversed without any cutting or stitches they feel more comfortable about accepting necessary treatment. To date, over 1,500 doctors from across the country and around the world have been trained in PST by inventor Dr. John Chao at the Pinhole Academy in Alhambra, CA with additional doctors attending training seminars scheduled on an ongoing basis. The simplicity and ease of the Chao Pinhole Surgical Technique® is encouraging patients all over the world to have needed treatment for gum recession. For more information on PST, information on training for doctors or for a referral to a local PST provider visit http://www.PinholeSurgicalTechnique.com or call (888) 603-2953. John Chao, DDS, MAGD is a leading dentist, educator and the inventor of the patented Chao Pinhole Surgical Technique. Dr. Chao is a graduate of the USC School of Dentistry and he is well known as an authority on dentistry throughout Southern California. Dr. Chao is a lecturer and clinical instructor at the Ostrow School of Dentistry of USC in the Community Dentistry Division, teaching on the subjects of pain and anxiety management, ethics and professionalism. Dr. Chao practices in the Los Angeles area.